New wave of alternative energy cellphone is on the move, and as initial collaboration between Puma AG and Sagem Wireless has announced operator and retail partners in eleven European markets. You will soon able to see Puma solar powered cell phone on sale in UK, Germany, Italy, Netherlands, France, Switzerland, Austria, Greece, Romania, Macedonia and Slovenia. 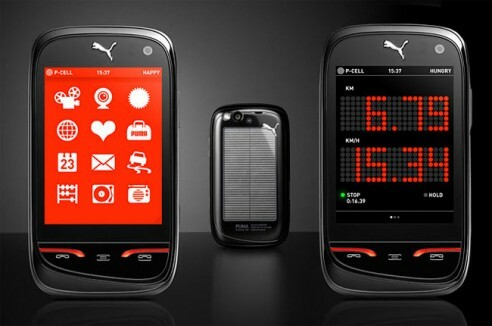 PUMA Phone is an active smartphone comes with Internet, messaging, video calling, Bluetooth photo sharing, and GPS localisation capabilities with solar charging. Users will also be able to experience to interact with multimedia content, applications, and m-commerce services from puma.com. An overseas market that has reached distribution agreement is United Arab Emirate in Middle East. And as part of PUMA’s long term commitment to sport in Africa, Puma Phone will soon be carried by operators in Uganda, Madagascar, Kenya, Mauritius, Cameroon, Botswana, Tunisia and Senegal. “Whether it is the Unity Kit at FIFA World Cup 2010 or the groundbreaking yacht design for the Volvo Ocean Race, PUMA is unlike any other sportlifestyle company. 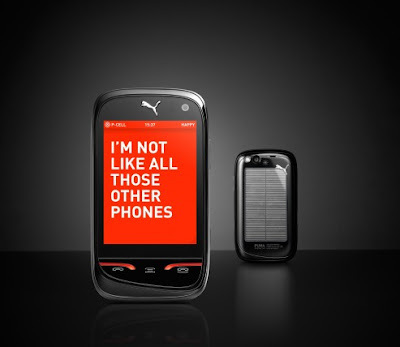 The PUMA Phone is consistent with everything PUMA stands for – joy, environmental responsibility and individuality,” said Jochen Zeitz, Chairman and CEO of PUMA.